The Apple Thunderbolt Display is a 27-inch flat panel computer monitor sold by Apple Inc. from July 2011 to June 2016. As of 2019, it is the final standalone display designed and sold by Apple. It replaced the former Apple LED Cinema Display. New to the Thunderbolt Display was the switch from Mini DisplayPort and USB to a single Thunderbolt connection for data transfer between computer and display. The increased throughput from switching to Thunderbolt enabled inclusion of a Gigabit Ethernet port and a FireWire 800 port on the display. Older model Macs introduced prior to 2011 with Mini DisplayPort are incompatible with the Thunderbolt Display. Like its 27-inch LED Cinema Display predecessor, the resolution of the 27-inch model is 2560×1440 pixels, and follows a 16:9 aspect ratio. It was made with aluminium and glass, having a similar appearance to the current ranges of iMac and MacBook Pro unibody designs. The display featured a built-in 720p FaceTime HD camera (replacing the iSight in the previous model), microphone, and stereo speaker system with subwoofer (2.1 channel). An octopus cable combining Thunderbolt and MagSafe is permanently attached to the back of the display for data input and charging laptops, respectively. There is also a separate Thunderbolt port, a FireWire 800 port, three USB 2.0 ports, and a Gigabit Ethernet port. The Thunderbolt port allows for the possibility of daisy chaining Thunderbolt Displays from a supported Mac, or connecting other devices that have Thunderbolt ports, such as external hard drives and video capture devices. Apple released Rev B of the Thunderbolt Display (model MC914LL/B) which includes a MagSafe to MagSafe 2 adaptor to the charging cable built into the display. On June 23, 2016 Apple announced through a statement that it was discontinuing the Thunderbolt Display and would no longer produce stand-alone displays, saying "There are a number of great third-party options available for Mac users." Apple subsequently worked with LG to design Thunderbolt 3 enabled 4K and 5K displays. 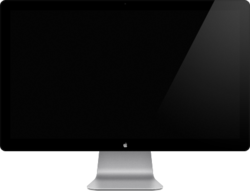 Apple Thunderbolt Displays, like the video input on Thunderbolt iMacs, drop compatibility with all previous standards, including VGA, DVI, and DisplayPort. They are not compatible with computers that do not have a Thunderbolt port, including pre-2011 Macs and the vast majority of PCs. As of April 2018, MacBook (Retina) 12" laptops only have a USB-C port, which cannot communicate with a Thunderbolt adapter. However, newer MacBook Pro have Thunderbolt 3 ports. Although these ports have the same connector as USB-C, they are compatible with the Thunderbolt protocol, and can use a Thunderbolt Display with a Thunderbolt 3-to-2 adapter. Macbook Pro (2011): 2 Displays: Can daisy chain two Apple Thunderbolt Displays together to get two displays, but the laptop's LCD may turn off. MacBook Pro (Late 2016): Apple released a Thunderbolt 3 to Thunderbolt 2 Adapter for enabling the Thunderbolt 3 ports of MacBook Pro (Late 2016) to connect to Thunderbolt 2 devices. The Thunderbolt Display must be connected using its built-in octopus cable, as the adapter will not work with a Thunderbolt 2 cable connected to the Thunderbolt Display's rear Thunderbolt port. MacBook Air (Mid 2011): 1+1 Displays: Can use one Apple Thunderbolt display, in addition to the MacBook Air's own display. MacBook Air (Mid 2012): 2+1 Displays: Can daisy chain two Apple Thunderbolt displays, in addition to the MacBook Air's own display. Mac Pro (Late 2013): 6 Displays: Can run six Apple Thunderbolt Displays using six Thunderbolt ports. Mac mini (Late 2012): 2 Displays daisy chained. Mac mini (Late 2014): 2 Displays. Mac mini (2018): 2 Displays using TB3 to TB2 converter. Display 27 inches, TFT IPS active-matrix LCD, glossy glass covered screen, QHD (2560x1440 pixels) resolution, LED edge-lit backlight. In April 2018, Apple confirmed that a new generation of Apple-branded displays will be released after 2018 alongside with the next generation of the Mac Pro. ^ a b Clover, Juli. "Apple Discontinues Thunderbolt Display". Retrieved June 24, 2016. ^ a b "Apple – Thunderbolt Display – Read the tech specs". Apple Inc. Retrieved August 20, 2011. ^ Miles, Stuart (November 1, 2011). "Apple Thunderbolt Display review". Pocket-lint. Retrieved January 22, 2013. ^ "Apple Says It's Out of the Standalone Display Business". ^ "Apple Planning Modular Mac Pro Release for 2019, New Pro Workflow Team Providing Feedback for Professional Needs". ^ "Apple Thunderbolt Display 27-inch User Manual" (PDF). ^ "Adapters for the Thunderbolt 3 (USB-C) or USB-C port on your Mac". ^ a b Slivka, Eric. "Apple Thunderbolt Display with Multiple Monitors: No Daisy Chaining Mini DisplayPort Monitors". macrumors. ^ "Dual 27" Apple Thunderbolt Displays Daisy Chained via Macbook Pro". YouTube. September 22, 2011. ^ "MacBook Pro 15" with Retina Display Can Run 3 External Displays". Retrieved February 21, 2014. ^ "MacBook Pro Retina Display does not run 3 Thunderbolt Displays". Retrieved February 21, 2014. ^ "Review of Apple Thunderbolt Display". AnandTech. ^ "Thunderbolt ports and displays: Frequently asked questions (FAQ)". Retrieved March 4, 2014. ^ "How to connect an Apple Display to a USB-C MacBook". Macworld. Retrieved October 10, 2016. ^ "Mac Pro (Late 2013): Using multiple displays". Retrieved February 21, 2014. ^ "Apple Thunderbolt Display – Technical Specifications". Apple Inc. September 16, 2011. Retrieved September 17, 2011. ^ "Apple Refreshes Mac Pro Lineup, Says All-New Modular Model With Apple-Branded Pro Displays Coming After 2017". ^ "Apple-branded display in the works for iMac 'Pro' and Mac Pro".